The strange cat and I sat a while. We kept our eyes narrow, and looked not upon each other but on the night air, while I became akwaynted with his scent and he with mine. I knowed he was a gib cat like myself. But there was a smell about him that I didn’t know. It come sharp to my nostrils and troubled me a little. Then I caught the smells of leather, and of a man full-grown. Two women next. Fresh milk, a house dog, a boy. And a whiff of horse. None of these was an offence to me. After a time he settled with folded paws, and I did the like. We studied the grass beneath our noses. I was still minded of the spy cat Master Grey, who told me he would find me. Thinking this cat might have been sent to gather my spy newes (of which I have none), I spake first. 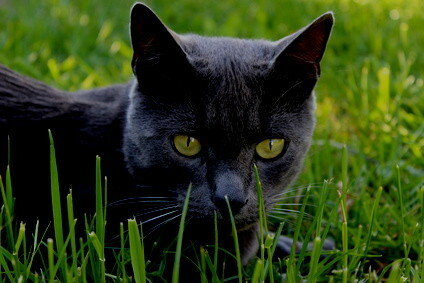 I sayt, “By night all cats are grey.” For I believe this saw [saying] is how we spies know one another. That set me about, I do confess. For if these were the next words we spies must say (or something like) I knew not how to reply. Then it come to me that here might be the onlie chance I would have to rid myself of that bloodie knave who wished to drown me. And I thought: He knows nowt of policy nor papists, so he does not serve Master Grey. Which meant I could not hope that Lord Purrlie [William Cecil, Lord Burghley] will take that bloodie knave hence and have him stretched. 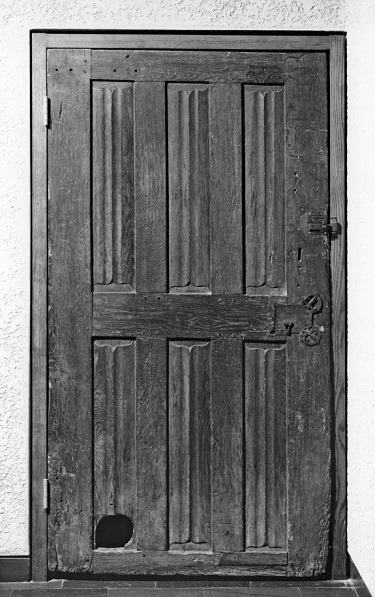 This door with a cat hole dates from around 1450-1500, and came from France. It’s held in the Walters Art Museum. Then this cat told me he has a very good place in the smith’s household, where all call him Smokie. When the weather is fair he keeps thieving birds and mice from the garden his mistress tends, and rats from the little house where her fowls lodge. When it’s cold he stays in their shop [the smithy] and deals with rats and mice there. He’s accustomed to the shop noise, and there’s a hole cut in the door for him so he might go from shop to house as he pleases. Then came musick to mine ears. Smokie sayt that the men and women who come to the shop bring many tales and much newes, but he had never heared any so good as mine. He hoped we might be friends. Smokie also sayt he knows a cow, and goes with the young mistress to milk her. His young mistress sometimes squirts milk at him instead of in her bucket, and he tries to catch it in his mouth. A sport that ends with him wiping his face with his paws and then licking them clean. And he sayt I would be most welcome to join him at the milking and take a squirt of milk there. Oh, what a sweet fellow this Smokie is. I love him alreadie. The “bloodie knave” and Gib clashed over territory (the library) in 1: I Begin a True Relation of My Life. The “Stew Queen” and the “Great Queen” are Mary Stuart Queen of Scots, and Elizabeth I of England. Gib learnt about politics and religion from the spy cat Master Grey in 14: I Am Turned.